One of the ways of looking at the health of a hedge fund business is in staffing levels. Like many other businesses in finance hedge funds cut back on headcount in late 2008 and into 2009, and the cutbacks in London based hedge funds continued into 2010 (see this article for data on last year). 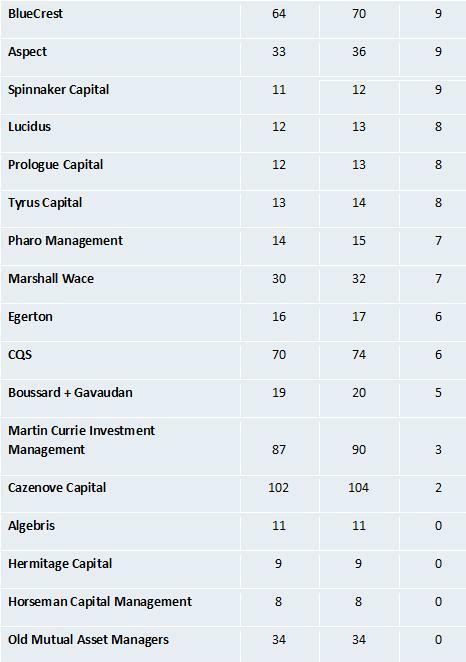 The tables here are disaggregated and show that of the 48 largest indigenous hedge fund groups under the FSA's jurisdiction 28 added staff at the level of approved persons (APs) - those carrying out partner/director/AML and compliance/investment/CEO/COO/CFO type functions- over the period from August last year to August this year. 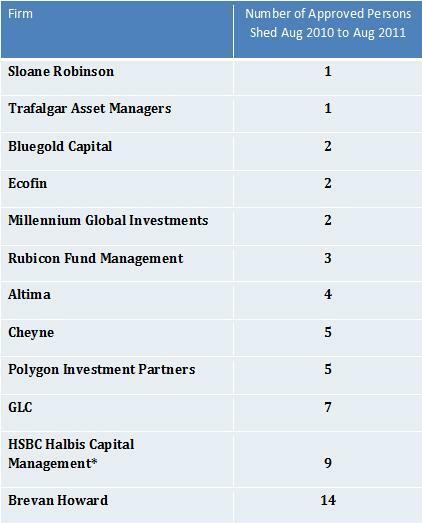 In aggregate the top 48 hedge fund managers (by assets) in London added 6% to professional numbers over the year to August. It was noted here a year ago that headcount, as captured by approved persons registered with the FSA, was still declining two years after the original Credit Crunch of this century. So at last in 2011 hedge funds have got far enough beyond the assets under management low of late 2009 to have sufficient confidence in the stability of their businesses to add to their staff numbers. 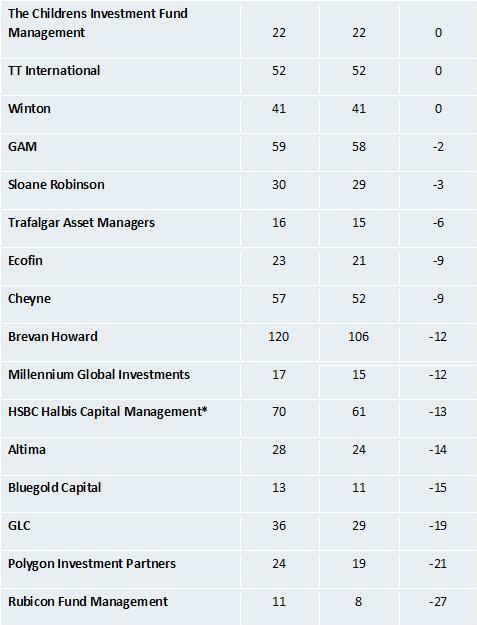 The hedge fund management groups that have shed the most staff are given in Table 2 below. Ignoring the firms that have reduced Approved Person headcount by one or two people, which may be just frictional changes or voluntary departures, many of the firms appearing at the lower end of the Table have undertaken significant change post the Credit Crunch. The firm that has made the largest absolute number reduction in their professional staff is Brevan Howard, which has opened up a trading operation in Switzerland so that formerly London based staff can escape the increase in taxation in the UK. The exodus was led by CIO Alan Howard who has been followed by co-CEO Nagi Kawkabani to Geneva. Up to a hundred traders may be based in Geneva in time. However the opening of the Swiss office is not the only development. Brevan Howard has reconfigured the investment capabilities of the traders/managers employed. Specifically BH has cut back on allocations of capital to equity markets and funds resulting in staff departures, including a manager recruited specifically to launch an Indian equity fund, and the departure of Fabrizio Gallo who is returning to the sell-side. Gallo's BH Equity Strategies Fund has been closed. Instead the emphasis has been on adding to capabilities in commodities and macro trading. This repositioning has resulted in a net reduction in London-based investment professionals, but an expansion of the number of traders for the whole firm. Further Brevan Howard funds have produced good performance this year, and the firm is expected to continue to add teams in order to increase capacity to manage capital. Corporate reorganisations have played a role in the appearance of other firms in Table 2. The Approved Person headcount given for *HSBC Halbis Capital Management was up to June 2011. At that point HSBC Halbis, the alternative asset management business of HSBC, was merged into HSBC Global Asset Management, and as ever in such a merger there was duplication of staff resulting in voluntary departures and redundancies. Polygon Investment Partners has moved from a multi-strategy approach to running a series of funds dedicated to specific investment strategies. The flagship Global Opportunities Master Fund was finally closed earlier this year, after a two-year-plus wind up process, and the residual illiquid holdings are now in the Polygon Recovery Fund. The reduction in approved persons at Polygon took place in Aug-Sept 2010 as six people left in a short period, and head count has been stable amongst the professional staff since. At Rubicon Fund Management the spat between returning head honcho Paul Brewer and the two men who deputised for him as CIO for two years, Timothy Attias and Santiago Alarco, has led to the change in numbers. The former co-CIOs left in January and April this year to set up their own firm Sata Partners. Altima Partners had its peaks in assets in mid 2008 and its peak headcount in early 2009. Asset under management were $4bn three years ago and are now thought to be around $1.9bn. The count of APs has followed a similar path, though with a lag as one would expect. 38 staff members were registered with the FSA in January 2009, and the present number is 23, down from 28 in August of last year. 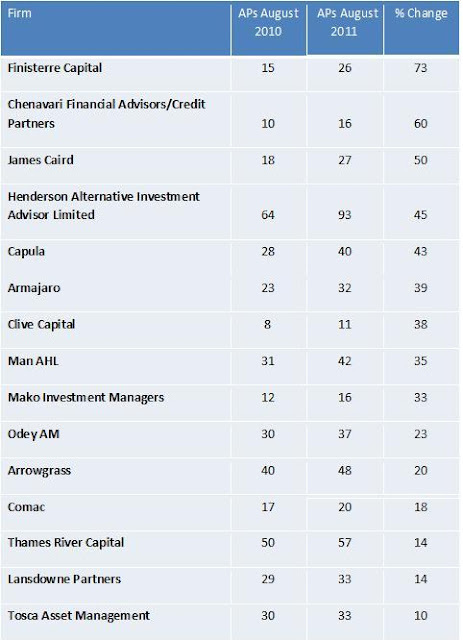 The third Table here ranks the firms amongst London's largest hedge fund managers that have added the most Approved Persons with the FSA over the period August 2010 to August 2011. In percentage terms Henderson's takeover of Gartmore has increased the Approved Persons count in a step-change by 45%, or 29 individuals. In hedge fund terms there was some overlap in the geographical areas invested in by the two companies when separate, but the styles used to run the European equity funds, for example, were very different. This has allowed Henderson to keep most of the Gartmore investment staff, though there are bound to be some who lose out in jockeying for position in such a takeover. There are more themes at play in the Table listing those firms expanding than in the Table ranking those firms with declining investment and senior staff. Losses of staff numbers may be for idiosyncratic reasons, but firms add to their payroll when they have been growing their revenues for a while. In the hedge fund industry that growth in revenue can come from performance fees, based on better investment returns than a previous period, or, more likely, from higher assets under management (from subscriptions plus investment growth on existing assets). So the firms adding investment staff in 2011 would be expected to be those that have performed well enough to attract new assets. The investment strategies that are represented in the list of expanding firms are clustered. The first cluster is in global macro/CTAs/commodities - Capula, Man AHL, BlueCrest, Armajaro and Clive Capital. There are some multi-strategy winners - Mako Investment Managers, Arrowgrass and CQS, but perhaps a less obvious winner is in credit management. 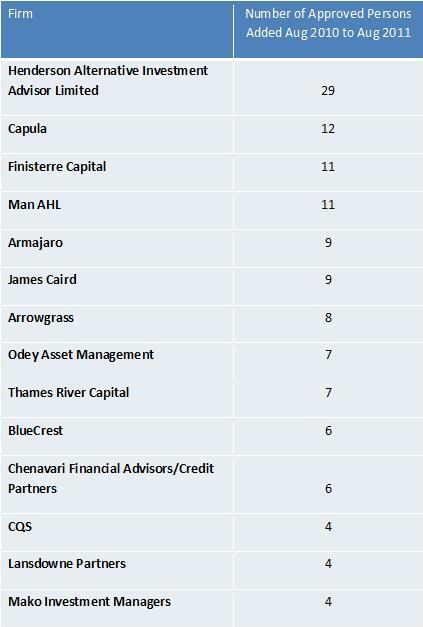 The third cluster consists of Finisterre Capital, James Caird Asset Management, and Chenavari Financial Advisors/Credit Partners - all with a considerable credit aspect to their investments. The increase in staff numbers at Europe's largest hedge fund groups over the year to August 2011 is far from dramatic at 6%. It does come after nearly three years of decline. The strategic thrust of the global hedge fund industry has been to expand in numbers in Asia and/or emerging markets rather than Europe (or even the United States). So it is good to observe some growth in headcount in the London-based part of the industry. The fact that the owners and managers of those businesses have shown caution in adding to their cost base via the headcount in the last year should serve the industry's employees well, as tricky times have returned from the middle of this year. Although there are the highest level of redemption notices for the year in place for the end of this quarter, I don't expect even a majority of them to be acted upon. And consequently I expect the employment levels in the London hedge fund industry in the first half of next year to be similar to those we are seeing now. Some stability would be be very welcome.